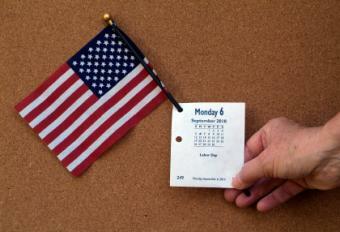 Taking place the first Monday of September in the U.S., Labor Day is the last holiday of the summer season. Help this summer go out with a bang by celebrating the occasion with friends and loved ones. Whether you want to spend an intimate day with your immediate family or throw a huge party, there are many ways to celebrate Labor Day. Depending on your schedule, budget and guest list, there are many day and evening activities to choose from. You can go the traditional celebration route or start new customs this Labor Day, such as throwing an end of summer theme party. Local Community Day: If your small town or large city features organized Labor Day events, celebrate the day participating in many traditional community activities. This may include things like a Labor Day parade and an evening fireworks show. 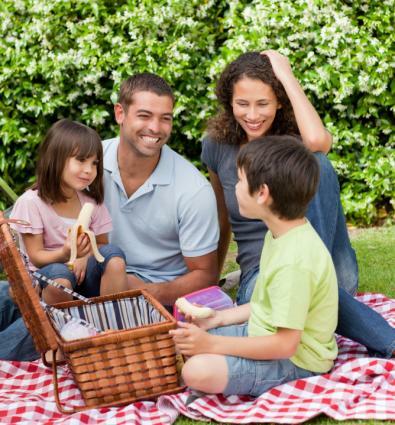 Picnic: Picnics can be small family events or large group gatherings. Plan a family picnic, complete with a checkered tablecloth, outdoor games and delicious summertime foods, such as fried chicken, corn on the cob, watermelon, potato salad and lemonade. If you're attending a large picnic, such as a company-sponsored event, don't forget to bring sports equipment, such as a baseball mitt or volleyball, for group activities. Block Party: If you are friendly with your neighbors, plan a fun block party together. Ask each family to bring a covered side dish and grill hot dogs and hamburgers for the group. Plan fun games for the kids, including such as relay races or water balloon fights. Some block parties even feature blow-up bounce houses or water slides for the children. End the evening with dessert and a movie displayed on an outdoor screen. Pool Party: Pool parties never go out of style, and Labor Day may be your last time to host one this year. Plan a fun day in the sun with pool games, tropical drinks and a barbecue. Serve basic barbecue foods, such as grilled chicken, sausage or hamburgers, or grill steaks, shrimp and vegetables for guests. Extend the gathering into the evening, and string up small white lights or Chinese lanterns to set a festive tone. Football Party: Celebrate the commencement of football season by throwing a tailgate themed Labor Day celebration. Encourage guests to wear their favorite team's jerseys and serve football-friendly foods such as chicken wings, pizza and chips and dip. Don't forget the beer, but make sure there are enough designated drivers. Under the Stars Party: If you have the budget and energy, plan an elaborate "Under the Stars" theme party this Labor Day. The elegant gathering will take place outdoors, and you can decorate with white candles on the outdoor tables, string white lights and white paper lanterns. Serve dinner by candlelight to start the evening. Hire a DJ or a live band to perform swing or big band music for dancing. Water Weekend Getaway: Take advantage of the three-day weekend by planning a mini-vacation getaway. Choose the best body of water that is within a half a day's drive, such as a lake, river or ocean resort. Camp outdoors, rent a cozy cabin or stay in a high-end deluxe resort, depending on your preferences and budget. Swim, fish, sail, waterski, surf or snorkel all weekend. This type of Labor Day getaway can be romantic and private, or you could rent a large house and invite the entire extended family. The DOL says Labor Day has been on Monday since 1884. The Department of Labor (DOL) features some interesting facts about the origins of the Labor Day holiday. The first Labor Day was first celebrated in New York City on Tuesday, September 5, 1882. The popular holiday is a tribute to worker contributions to the prosperity, strength and well-being of the U.S.
No one is for sure who first proposed the holiday - some people believe it was Peter J. McGuire, a co-founder of the American Federation of Labor and the general secretary of the Brotherhood of Carpenters and Joiners. Others think it was Matthew Maguire, the secretary of the Central Labor Union of New York. Most of today's generation views Labor Day as the holiday that signifies the end of summer and beginning of the new school and work year. Parades and speeches by prominent citizens and politicians are still held on this day as a reminder to celebrate the spirit of the working American. Take a break from your busy work schedule and mark the end of the dog days by doing something special this year. If you're planning an outdoor event, make sure you have a backup plan in the case of inclement weather. Take advantage of this "last" summer day, as you'll have to wait a long nine months until Memorial Day kicks off another summer season.